Pour milk into a high-sided saucepan. Place a candy thermometer on the side of the pan. Heat the milk until it reaches-180 degrees. The milk will start to climb the side of the pan. Remove pan from heat and allow the milk to cool to lukewarm-110 degrees. To speed up the process you can place the pan in an ice bath. Sometimes I do this and sometimes I am just lazy and let it cool on its own. Both ways work. When the yogurt is cool, put the yogurt starter in a large bowl. Stir in some of the milk. Whisk well. Make sure the yogurt is dissolved. Add the rest of the milk and whisk until smooth. Pour the mixture into the jars of the yogurt maker. Follow the yogurt maker’s instructions. We usually do ours so it rests overnight. It takes 10-12 hours. We usually let it rest for 12 hours because we like our yogurt thicker. When the yogurt is done resting, chill it in the fridge with the lids on the jars. The yogurt will stay good for 10 days. I purchased my yogurt maker at Williams Sonoma. I really like the individual jars, but you can buy a yogurt maker that makes one large batch too. Find a machine that is right for you. Make sure you read the instructions before getting started. 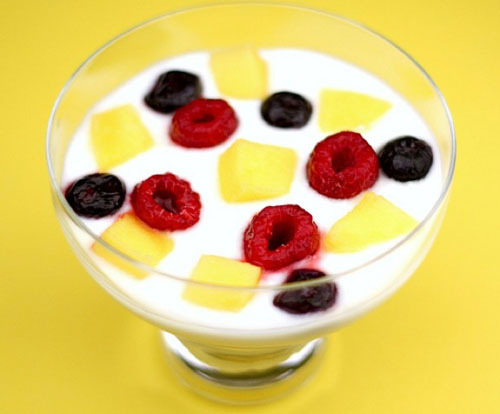 Make sure you choose a yogurt starter that has live active cultures. Use the freshest milk and yogurt you can find. I use fat free Greek yogurt because that is the yogurt I like. You can use a yogurt with fat. It just depends on your preference. I use fat free milk and yogurt and the finished product is thick enough for me. You can use your homemade yogurt as the starter, but only once. If you want really thick yogurt you can strain it with a cheese cloth or coffee filters.